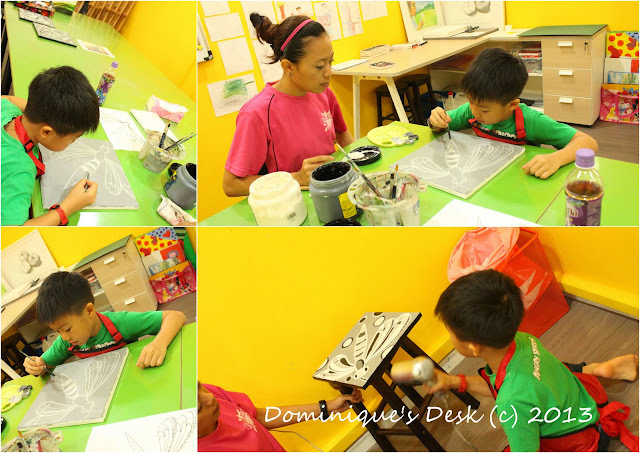 During the first week of the school holidays the boys went for an art camp at heART Studio. Doggie boy was in the monochromatic nature class and was taught how to draw and paint using the two basic colours- black and white. Before Doggie boy got down to painting teacher Elma explained to him that he would be drawing/painting on 3 different canvases over the period of three days. Samples were shown to him so that he could get a clear picture of how his completed work at the end of Day 3 would look like. Each day he will be tackling a single canvas and would be painting a flower and two other different pictures for the duration of this art camp. Before the pictures could be drawn onto each canvas the background had to be painted. Doggie boy had to blend black and white to form the shade of grey he wanted to paint the background. 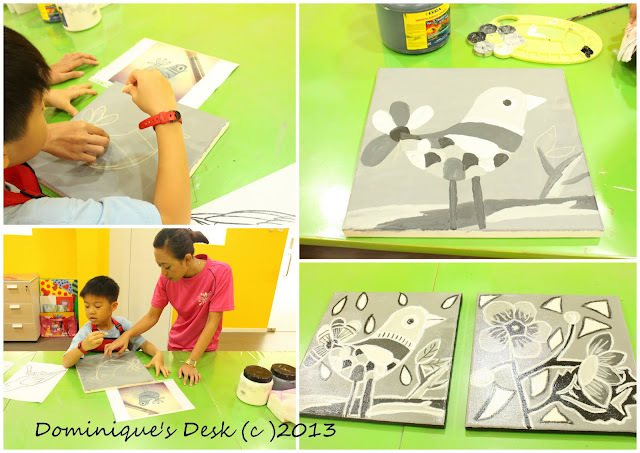 He chose a shade of light grey for the background and applied the paint to all three canvases under the guidance of the teacher. Once the background which had been painted had dried it was time for Doggie boy to work on the first canvas- the flower. 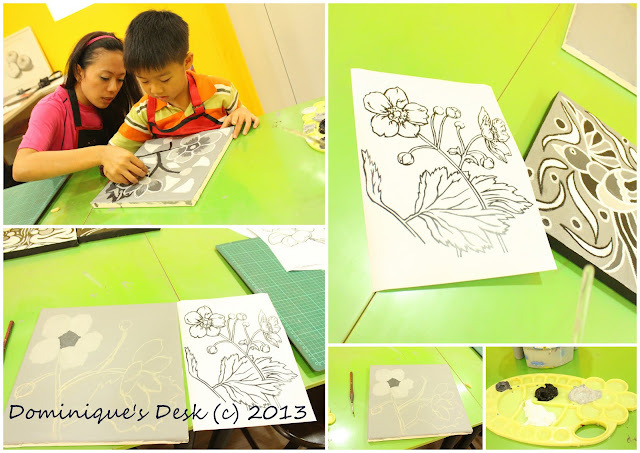 A photocopy of a flower was printed out and he was to trace the outline of the flower with chalk onto the canvas. 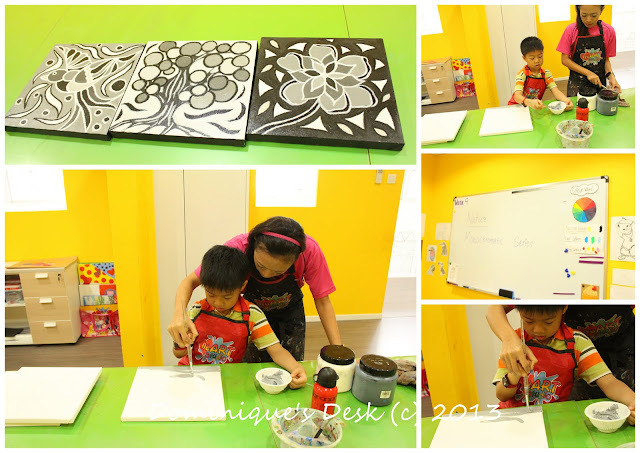 After the outline was drawn in Teacher Elma showed him how to paint in the different parts of the flower using the different shades available. On the 2nd day Doggie boy painted a bird. The steps that he had to do were repeated from day 1. As it was the 2nd day at heART Studio he was familiar with the routine and settled down to paint more easily as compared to the first day. On the 3rd day Doggie boy painted a dragonfly. He chose this insect as the theme was on nature. He initially wanted to draw some trees but changed his mind and went with a dragonfly instead as he thought it would look nicer on canvas. In all Doggie boy had a very enjoyable 3 day art camp at heART studio and learned about how to blend colors together with the different techniques in painting using acrylic paint. It was certainly an enriching experience for him. If you are looking for a great art experience do check out heART studio’s website for the latest information on classes for this holiday. Join in this week for Weekend Reflections. That was great to share the Doggie Boy’s experience in the photos. Everything looked so clean and tidy. He must have been thoroughly engrosed in his work. Yes it is the same place where I went to paint. Will be sharing my elder boy’s experience at art camp later in the week. Great job for your little one. He surely had a really productive 3 days art camp.